The SIGGRAPH 2013 Poster Program Exhibition as seen in a photo from the official SIGGRAPH 2013 media library. The 41st International Conference and Exhibition for Computer Graphics and Interactive Techniques, SIGGRAPH 2014 has opened the Call for Submissions for its Poster program, inviting submissions around the world. SIGGRAPH 2014 encourages submission of posters that explore not only traditional topics in computer graphics and interactive techniques, but also exciting new topics and applications in the field. The accepted posters will become part of and presented during ACM SIGGRAPH 2014 in Vancouver, in August 2014. Film and TV Production: Ideas and the applications thereof in recent productions, such as commercials, television shows, short films, and features. Games: Techniques and technologies used in the development of technical and visual content for game production as well as game post-mortems. Mobile Devices: Innovations and interactive techniques in graphics applicable to the mobile space. Visualization: New developments that focus new approaches in computer-generated visual imagery and design that have pertinent applications in science, education, medicine, and visual analytics. Computer-Aided Design: Presentation of new ideas in CAD with practical applications to engineering, manufacturing, architectural rendering, and geometric design, among others. Posters can be submitted prior to 18 February 2014, or 6 May 2014, the late deadline. In both cases, posters are reviewed by the same jury using the same criteria. Authors submitting prior to the early deadline will receive decision notification in mid-April. 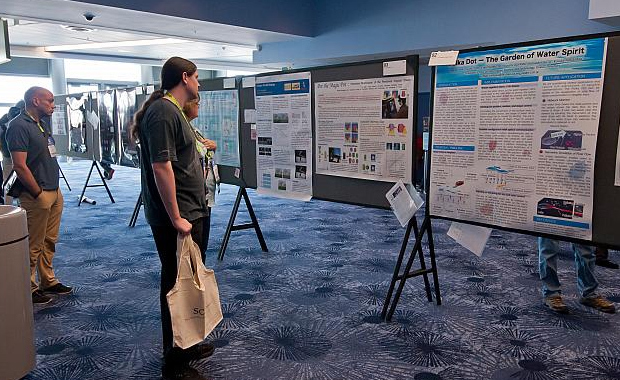 The SIGGRAPH 2014 Poster program also hosts the ACM Student Research Competition. Slightly trimmed version of The Great American Divide (Part 1) - painting by Wendy Cross, one of the accepted artists in the International Painting NYC II juried exhibition.